You are here: Home>Archive>Taylor Brown Collection.>Marriages.>Frank Brown and Blanche Wildman's wedding. Frank Brown and Blanche Wildman's wedding. Photocopy of a photograph showing the wedding of Frank Brown and Blanche Florence Wildman. The picture shows four rows of wedding guests in fine clothes. They are arranged in a garden with a house behind them. This photograph was enclosed with the letter item TBC/05/032. 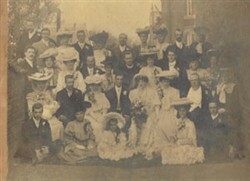 The wedding of Frank Wise Brown and Blanche Florence May Wildman on the 27th August 1906.The picture was taken near to their future home at 2 Windsor Street, Wolverton, the bridegroom’s parents Walter and Sarah are seated on the groom’s left hand side as you look at the photograph and the bride’s father sits to to her right.